"I shall accomplish the courageous deed, or else end my days in this mead hall." As you wait for the big-budget, all-star Robert Zemeckis production of Beowulf, it may be interesting to spend some time with the original Old English saga. One of the few extant examples of the roots of the English language, Beowulf is legendary both as an epic poem and as a dreary exercise in academia. This one man show starring Benjamin Bagby presents the first major section of the classic poem as it might have been performed by a bard around a fire more than a thousand years ago, chanted in the original tongue and accompanied by an Anglo-Saxon harp. The ancient tale tells of Hrothgar, king of the Danes, who built the mead hall Heorot. Unfortunately for him, he built it too close to the marsh den of the monster Grendel, who attacks and seizes 30 men to devour. Terrified of Grendel, Hrothgar becomes a king in name only until Beowulf, great warrior of the Geats (a people of Western Sweden) hears of his plight and comes to face the monster. Since Grendel cannot be harmed by weapons, Beowulf decides to face him bare-handed. This covers approximately one-third of the epic, leaving out the subsequent battles with Grendel's mother and a dragon. As the most familiar part, it's rather self-contained and works well for an evening's entertainment. The way remains open, in any event, for Bagby to perform Beowulf II and Beowulf III. The language is delightful in live rendition, with a harsh and evocative musicality of its own. Fans of Tolkien (himself a Beowulf scholar) will recognize many terms, such as th�oden, �orlingas and orc. Bagby's performance is truly amazing. He has a marvelously resonant and evocative voice that carries many different tonalities depending on the context of the lines. Alternately bragging and ferocious, despairing and pained, he gives a wonderful reading of what too many know as a dry text. Those not up on their Old English can follow along with the Modern English subtitles, which provide a literal translation rather than attempting to mimic the rhythm and meter of the original. The addition of the Anglo-Saxon harp, constructed in imitation of archaeological fragments makes a fascinating counterpoint to Bagby's rich voice. Light and delicate in nature, the harp almost sounds like a quiet banjo as it contrasts with the vigorous vocalizing. Although the music is quite conjectural in nature, no Anglo-Saxon music having survived, the text does survive in a single copy written by a tenth-century scribe. The scribe was certainly a Christian, telling a tale of what were in fact pagan peoples, resulting in a tension between the two cultures, of the teller and the tale. There is a bit of sneering at Hrothgar's subjects turning to heathen sacrifices, but by the same token there's an admiration of Beowulf's sense of honor and his willingness to sacrifice himself for Hrothgar and his people. The latter probably appealed, perhaps subconsciously, to the symbology of the scribe's Christian sensibilities. The poet or poets also incorporated vivid word pictures that cannot help but bring us into a world lost to the mists of time. 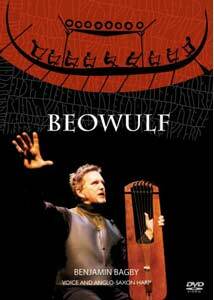 As an integral piece of our linguistic heritage, Beowulf is accessible here as it has not been in a millennium. Image Transfer Review: The anamorphic widescreen transfer attempts to make up for some inherent softness by adding an excessive amount of edge enhancement; the result is vivid haloing around the opening shots. Fortunately, most of the performance is simply Bagby against a blue curtain, so the edge enhancement isn't too noticeable otherwise. The color is vivid, nicely so for a live performance. There's reasonably good detail on closeups, and the rough-hewn texture of the backdrop comes across well. Audio Transfer Review: The 2.0 audio is very clean and vibrant. The Swedish hall where Bagby performs has very nice reverberation, giving an air of a large open hall that suits the source material. Hiss and noise are practically nonexistent. The timbres of Bagby's voice are faithfully reproduced, as well as the delicate plucking of the harp. Extras Review: If you're feeling like practicing your Old English, the subtitles are optional. There are no subtitles on the two accompanying presentations. The first of these is a somewhat pedantic roundtable (21m:39s) between Bagby and three professors who have written on the epic, discussing whether Beowulf is literature or something else. They do provide a brief history of the manuscript and its near loss in a fire in the 18th century. More interesting is Bagby's discussion of the music and his instrument, including the process of constructing the harp and how he "finds the music" in the text. Notably, Bagby also does not write anything down, preserving the oral tradition in his own way. Luckily we have this record of his performance, something more than the medieval bards left us. An amazing performance brings the Dark Ages to vivid life. Highly recommended for your mead hall entertainments.